Are you currently searching the web for best online programs in your field of choice? We collect a significant amount of data from online program websites to share with prospective students. And we COULD develop a proprietary algorithm to create a variety of “best” rankings of online degree programs. But we think that there are already too many of these relatively meaningless rankings sources, including for example, U.S. News & World Report, or OnlineU.org, or thebestschools.org. What sentient human being isn’t curious about online degree programs that are, allegedly, the Most Affordable or the Best? But, be careful. Many prospective students find researching online program options confusing and overwhelming. This leads them to select programs based only on a few sources that bill themselves as “authoritative”. Aspiring students ultimately own their purchase decisions when they complete an online degree. Why rely on others to do what you can do for yourself? Here are 3 of many possible examples that prove the rule on why you should create your own ranking. And, really, why accept rankings offered by marketers as authoritative anyway? U.S. News & World Report: A recent article tells the bombshell story about the 4 years running #1 ranked online MBA program caught providing false data to U.S. News & World Report. Their methodology relies on the veracity of institutions that provide their proprietary data annually in a survey. This is not the first time a university was caught enhancing their numbers. The pressure to perform well in U.S. News & World Report rankings creates the urgent temptation to cheat. This significantly undermines the value of these rankings to students. Students generally want to know the total cost of the degree, not just one year’s tuition. Fees are left out of the annual cost equation (in the case of the #1 ranked institution, the graduate fully online fees raised the total cost per credit to $426 from the $255 reported on the website). Many institutions price online programs differently (e.g. the online MBA at one institution may be 20%+ more expensive than their online M.Ed. program). This simplistic ranking approach completely obscures this information and offers a misleading impression of real costs to prospective students. thebestschools.org: The website claims to be the “the web’s most thorough and reliable source of information”. They use a proprietary “multicriteria optimization” algorithm that analyzes key data indicators. These indicators are taken from widely available, high-level data that institutions report to the federal government. But the “Best Of” lists of online programs here contain only details about “Featured Programs” not actual best program listings. This secret sauce approach to fancy, proprietary algorithms is a common trait among rankings websites. And they use rankings to game Google algorithms to earn higher SEO scores with large amounts of often meaningless content. How is this helpful to students researching online degree programs? The Online Degree Database knows that it’s better for students to have all of the data to use in their decision-making. It’s not helpful to have a hastily-thrown-together, misleading summary of these data. We give you the data and the tools you need to create your own ranking of online degree programs. You choose the criteria and the approach that makes the most sense for you. Then you apply it to the universe of available programs in our database. And, we do not ask for or sell your contact information to universities. Our university sponsorship program, a source of funding for the database, is attractive to universities for several reasons: They see the value in competing fairly against each other. And they agree that student enrollment should be driven by positive program characteristics, not the size of the online program marketing budget. We’ve created simple, unbiased rankings of online programs by program type using our data before. And we’ve demonstrated how our data are more reliable than what you find at other websites through our other blog posts. But the true value here is that you can use the data on our website to create your own, personalized rankings based on the criteria most important to YOU. You define what is BEST. Use our interactive tool to select a degree program and complete your own “best” ranking analyses. Generate as many free reports as you need to get the result you desire. Is the location (state) of the school a top priority for you? Is it important that the program is professionally-accredited? What is the total tuition of the program (total cost per credit as reported by the program website times the total credits required to complete the degree)? Is the institution Public or Private? For Profit or Not-For-Profit? What is the minimum GPA requirement you need based on your undergraduate transcripts? Does the online program require a GMAT / GRE score for admissions consideration? Are there specific concentrations you are interested in? With over 4,240 (as of July 10, 2018) online programs from over 900 institutions in the database, you know that the online program research you complete with our website is truly the very best possible. The five criteria represent one possible straight-forward, personalized algorithm for defining BEST online MBA programs among many that are possible. We define “best” here as most affordable, AACSB accredited, 100% online, with minimum 3.0 GPA requirement, at only not-for-profit institutions online MBAs. 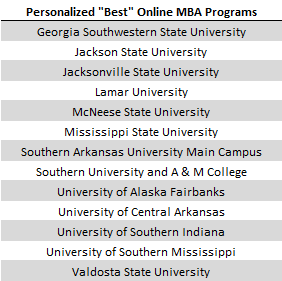 The 13 online MBA programs that fit our hypothetical criteria are shown in the table above. But clearly there are other combinations of criteria available in our database that are more relevant to you as you research your online degree program options. Let your inner data scientist out to play with the Online Degree Database! 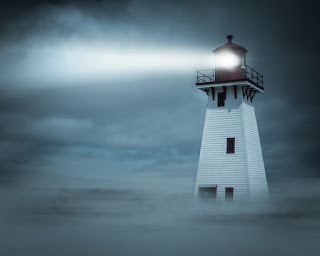 Because you start your selection process with very close to the universe of available programs, your free report is a very unique and valuable product. It cuts through the misleading information offered elsewhere and gives you what you really need to be sure you complete an accurate search: a personalized BEST online program list from the most accurate and complete source of online program information available. The free report that identified this list of programs provides additional information about these institutions. It includes the location (state), in-state and out-of-state total tuition, public/private institution status, and importantly, a link to the program website of the online MBA, so you can continue your research on your own. Find your inner data scientist and create your personalized “Best Online Program” rankings today!